Thanks for your interest about my life. This began in Madrid, concretely I born on summer of 1961 and I beguine in the model scene as usual than other people: in adolescence I make my early models, Corsair, Panther, etc.. from Revell, Airfix or Matchbox but immersed in the usual economic precariousness of Spain the mid-1970s. When I became adult and raised better economy level, I got a rough airbrush, discovered the putty and starting for first time to make models with the sense than today. Also I started my studies of delineation and I beguine to interested on the Red Army, or "dark side" because in those years of “cold war” was something almost subversive, full of topical and devoid any reliable information. 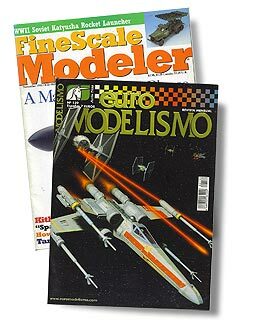 At beginning of the eighties I get my job in CASA (now EADS) as draughtsman and in 1983 I published my first article in a modelling magazine: Modelismo & Historia, in which I have become a collaborator of its sequels (Todo Modelismo and Euro Modelismo) as his chairman Rodrigo Hernández always liked my models and the drawings usually I added. My technical studies helped me so for make a good model, everything has be according to the graphic documentation as essential guide to reflect it on the model. My opinion is necessary paint well (the task more "bright") but also is necessary the task to detail a model correctly. As I wanted more information for detailed my models more I could see a vast emptiness of information about the Soviet Army and started to fill my library with Russian books or East Block , through direct swap with the so called "iron curtain" modelers. In the middle of 1980s I started my first transformations (T-34/85, T-55, KV-1 Mod. 1940) so the available models were only a handful and the list for build, endless. From that times you can see here a Tamiya’s SU-122, perhaps my first good model so I received much praise a quarter of a century ago and obviously today this outdated. Still left many years that appeared the first photoetched or tracks link by link. The metallic grid and plastic sheet was the usual materials used to detail the models. During those years I got married and fruit of it is a son and a daughter. Since then I reside in the district of Vallecas (Madrid). At the end of the 1980s I build on same quantity aircraft and military vehicles and which it I started to test fortune with the "scratch" technique as necessarily to obtain on my collection models as T-35, T-60 or a Su-76M. Some of these are show on Sovietmodeler.com. The faults so you can found on it, is the result of the usual lack of graphic material of these time. I always was “squeezed” the few available photos and little by little my interest for the army Soviet raised, to become a passion. In the 1990s, in which Verlinden was in full swing, I decided to travel to Russia to visit friends and take photographs of military museums beginning to have my own photographic file so regularly used in my articles. 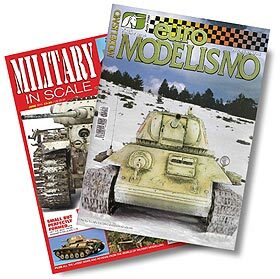 It was also during this years when I published my first article outside to Spain, specifically in Fine Scale Modeler. Although I recognize that my passion is the Red Army, I also build some models outside of this charper as a Chieftain tank, a Type XXI submarine, a Saab Draken fighter and other more. In fact is an affinity to some types of machines, Soviet or not. In the middle of the 1990s were my most prolific years in make drawings and here you can see a very good selection, in fact with this task I get my salary but since that task beguine to do with computer, missing the ink pen or "rotring" I left these facet permanently. Lost all interest for my not make properly with my hands and being processed necessary by a computer program. 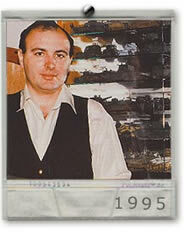 At the end of the 1990s had a rather refined “dry brush” technique, precisely when it began to be obsolete. 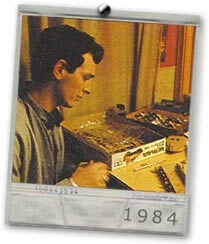 These years were in which I make few models, tested fortune in my other hobby: the music. I am a huge fan of Ana Belén and Jethro Tull. 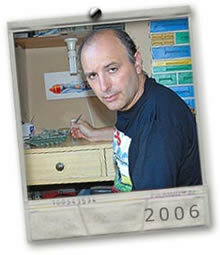 At the beginning of the new millennium when I take again the modelling was clear that I required a reconversion in the form of painting, so I was incorporated slowly new techniques with oil paints and pigments in my models. Due to my age is difficult break with old techniques and put focus on the newest so as you can see my current technical mixture learned in these three decades. Where I can’t updated my skill level is on aviation and now not raised the current "standard" so this facet I have been gradually relegating without abandoning it although I have incorporated into my new likes the "Star Wars" and navy models. It is in the summer of 2010 when I decided to make this web page to display everything I have done and while the forces no fail to me, I hope to continue. I think that you can see a good example of the evolution that has followed the modelling world, specifically in Spain from an "analogical" era until now in which the digital immediacy of Internet has revolutionized everything, also our hobby. Fortunately in this project have helped me Rodrigo Hernández and Marisol Chacon providing me a lot of pictures from models published in its magazine and also the good job of Carlos Pedregosa, webmaster of this page. To them I must thank that here my models “glow” as I never seen before. I hope you like my models.